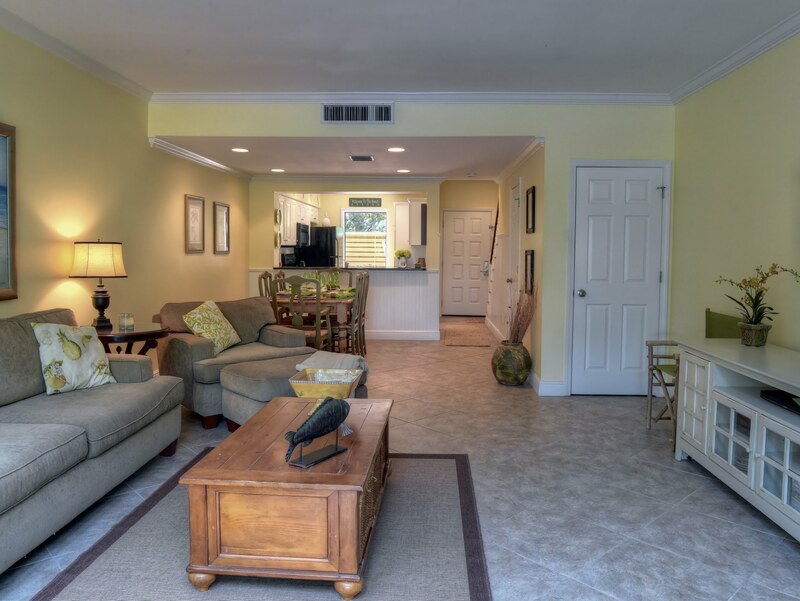 Your family will thank you for finding this delightful villa within the gates of Sandestin Golf and Beach Resort. This charming vacation rental is situated on the beach side of the resort in the popular Beachwalk Villa neighborhood. 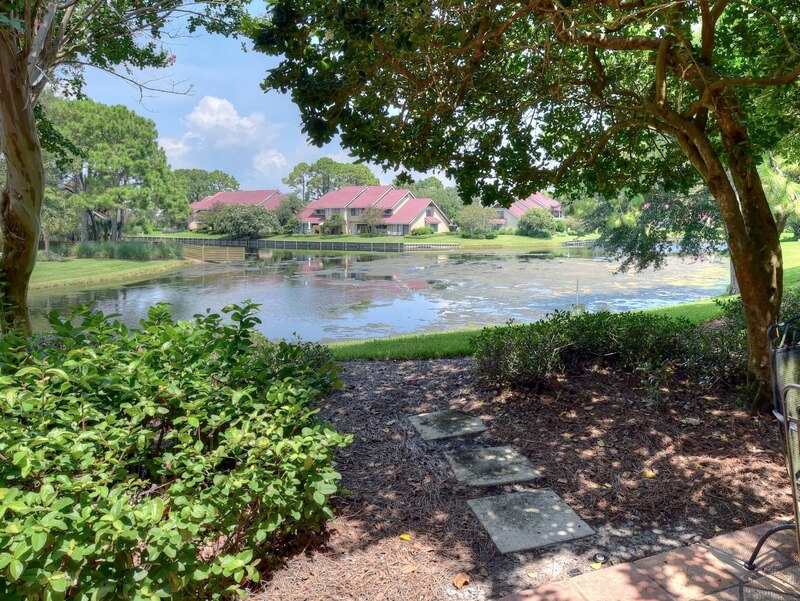 Although you are short stroll away from the sugar white beaches and emerald waters of the Gulf of Mexico, you are also surrounded by the tranquil setting of the lake and lush surroundings of Beachwalk. Families truly enjoy relaxing on the patio for an early morning cup of joe. 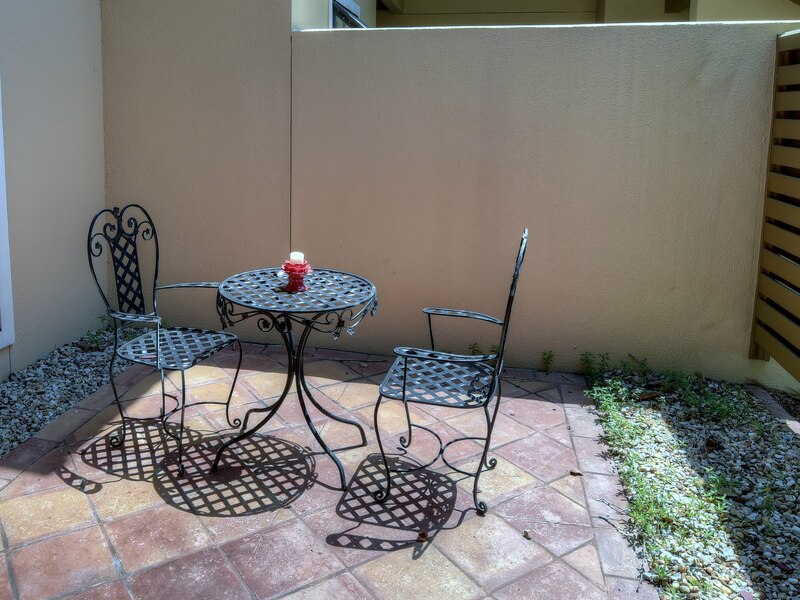 For your outside dining experience there is a 4-person wrought iron table and chairs. Make sure to bring your fishing pole to try your luck in the lake. Remember it is catch and release only. Also, be on the lookout for the family of ducks that call this their home. Upon entering, there is a small gated area that is tiled. This is a perfect spot to put away all those beach toys and gear. There is additional seating if someone needs a quiet spot to read or relax. As you enter you will notice how spacious the unit is with the living, dining, and kitchen all open. 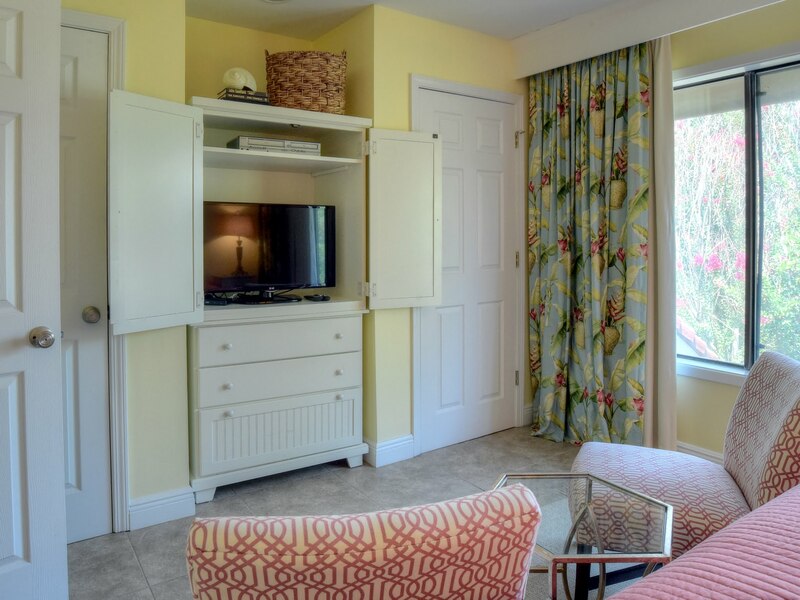 The light and bright décor and many sky lights remind you that you are in Florida and ready to enjoy your beach vacation. 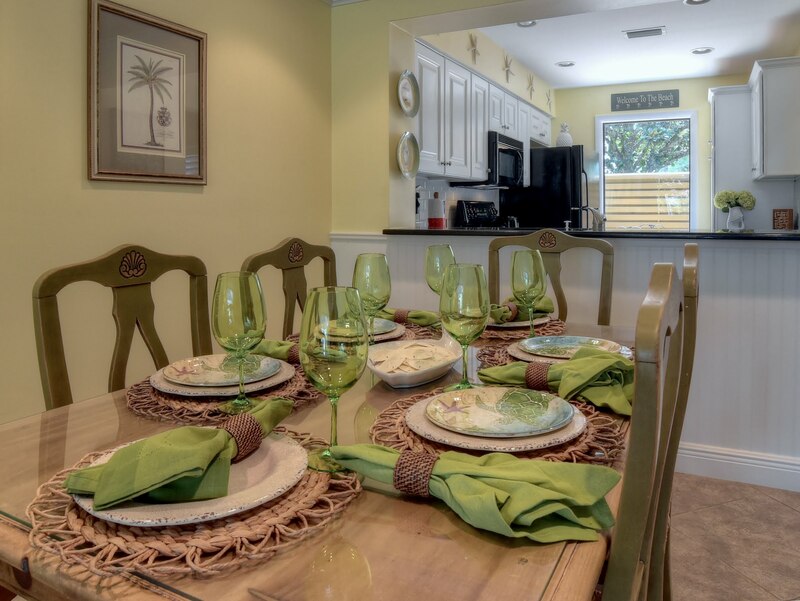 The kitchen is immediately to the right and is stocked with all the appliances and utensils you may need for a delicious fresh sea food meal. There is extra counter space and storage plus a breakfast bar to help display your buffet. For your dining experience there is a large table with 6 place settings. The living and dining areas are tiled throughout making is a breeze to clean up any sand that may have been drug in. There is a half bath downstairs for you or your guest convenience. The sleeping quarters are all upstairs along with the new front loader washer and dryer. 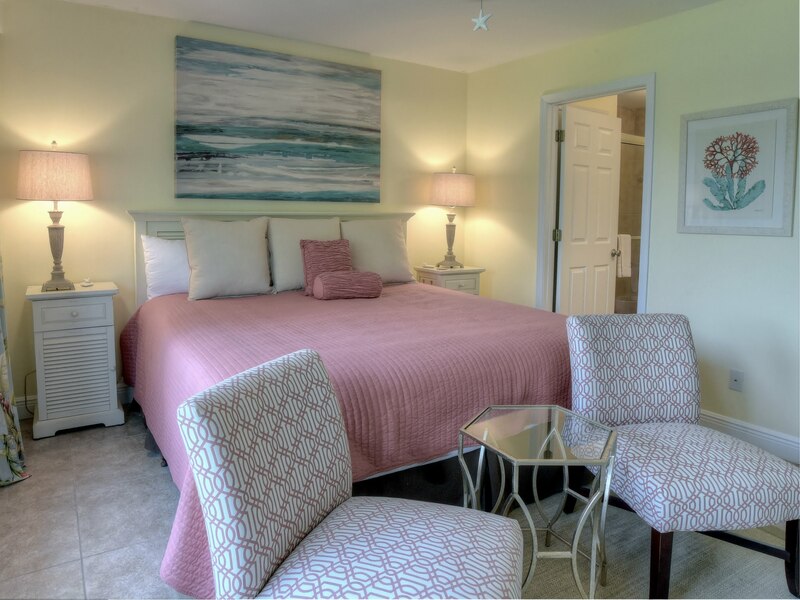 The master suite gives off such an inviting atmosphere with a king size bed and additional seating. Like the downstairs, it is all tile flooring in the bedrooms. There are 2 closets within the master that provide plenty of storage for your belongings. After a long day at the beach, the flat screen T.V. is perfect to just sit back and enjoy a movie or sporting event. You will be super excited to wash all that sand off in the huge tiled master standalone shower. The bathroom has been recently renovated and is captivating. The guest bedroom is also tiled and has 2 twin beds. The flat screen is wall mounted allowing for chest of drawers to store your cloths and personal items. Just a few steps away is the full bath with a tub and shower combination. Besides the fabulous beach there is loads to do all within a 1-mile radius of your villa. Visit the Village at Baytowne Wharf to find several boutiques, many restaurants, and plenty of family entertainment. There is a playground for the smaller ones and a zip line for the more adventurous. During peak season there is a spectacular fire work display and outdoor concerts to enjoy. 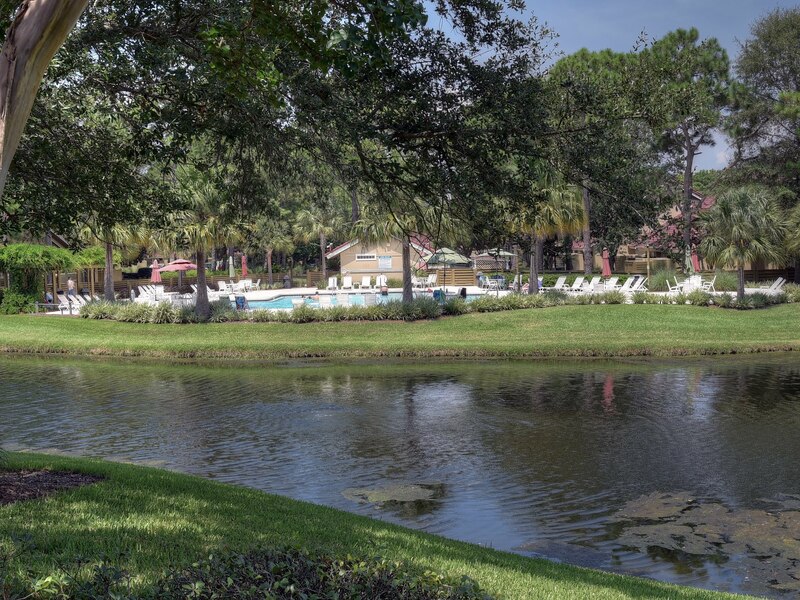 Sandestin offers 3 golf courses that are open to the public and a tennis center for the tennis enthusiast. Outlet mall shopping is just a minute away and has all the top line brands at discounted prices. There something for everyone in your party. Great family vacation at Beachwalk! This ended up being a great rental for us! 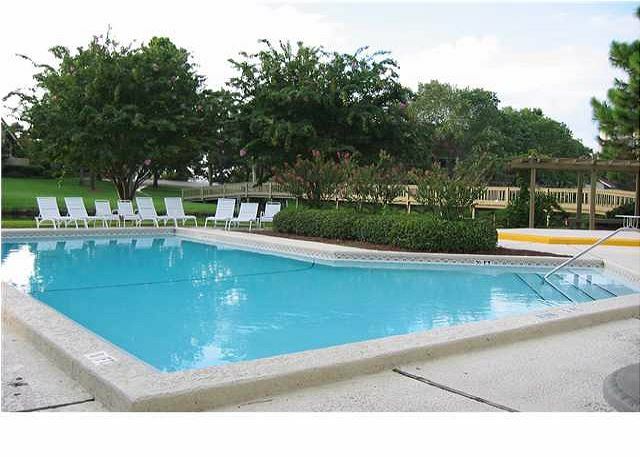 We do not like the big high-rise type condos, and were hoping to find more of a townhouse style home close to the beach. The Beachwalk condo was perfect. We loved the view of the lake and the pool. The beach was close enough to walk. Many people use golf carts or cars to get around the Sandestin resort, but we rented bikes and had endless bike trails to get around without getting stuck in traffic. The condo itself was very roomy for 2 adults and 2 teenagers. This was an awesome location for the beach and very nice home, perfect for my family of 4. We had one very small issue when we first arrived, I called and reported it, someone was there to fix in within the hour. I would highly recommend, you will not be disappointed. We enjoyed the location and the condo very much. Although when we arrived there was not a grill available they did bring one for our use. It was mentioned in the description that there was exercise facilities available we were unable to find this. The beach access was ok and was only a 5 minute walk. We found out that we were not able to rent a golf cart in this area for some reason. However, we would definitely recommend this and also return to this property. We are so pleased you enjoyed your vacation at Sandestin. This is such a charming villa to stay in and the peaceful back patio is the perfect place to relax after a long day at the beach. I wish we could have offered a golf cart however; the owner has to have one they allow guest to use. This owner does not have a golf cart. Sandestin does not allow golf cart companies to lease to their guest. I agree that that should be changed. Remember when you book directly with Platinum Vacations you will get a return guest discount. You will also avoid having to pay an extra service fee that the large 3rd party companies charge. Make sure to visit us on all social media for a chance to win our monthly giveaway. We hope to see you again in the near future. Great communication with Platinum during booking and before arrival. Property is nice and great location. Thanks so much for the kind words. We enjoyed working with you as well. We are also pleased to see you gave us the highest recommendation and for that we are grateful. Remember when you book direct with Platinum Vacations of Destin you do not have to pay a service fee that the 3rd party companies charge. Often times we are also running a discount if you call us directly. Please visit us on social media to learn about our monthly giveaway. We hope to hear from you again in the near future.